Skitch by Evernote, a popular screen capturing utility with built-in image editor which was previously available for Mac, iOS and Android is now released for the largest desktop platform, i.e. Windows. Skitch for Windows is absolutely free, supports XP or later including the new Windows 8. Now Capture screenshots, annotate and share images simply using Skitch’s easy to use interface and included set of handy tools. With Skitch for Windows, you can take a screenshot of entire screen or a specific area and add annotations like arrows, text, highlight an area using various colors, crop pictures, etc. The new Pixelate feature is another useful tool to hide any personal or sensitive information just by blurring a specific portion. Another interesting feature is the ‘Drag Me’ bar that lets you instantly save images to desktop and add your final images directly into email, documents without the need to save them first. Saving your Skitch image to Evernote is pretty easy if you’ve Evernote for Windows installed. 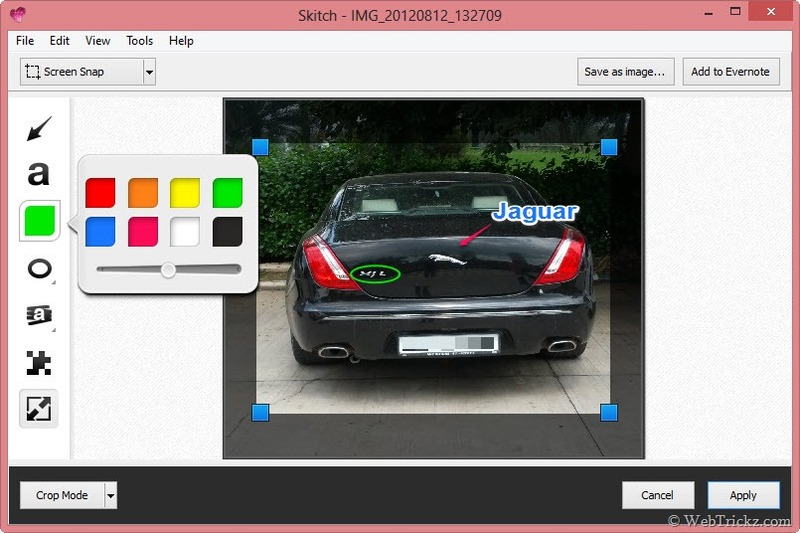 Another version of Skitch is also available, specifically designed for Windows 8. Skitch for Windows 8 takes advantage of the best features of Windows 8 and runs in a Modern UI environment just like other apps installed via Windows Store. Firstly, it packs an all new interface, offers ability to integrate Maps into Skitch and annotate them, Undo/Redo buttons to rectify any mistake while editing, Easy export and Split screen feature. Those using Windows 8 can install either of the two versions or both of them.